Thus far, the Central Bank of Ireland has resisted the urge to ‘optionally’ issue commemorative €2 coins as per their statutory allowance. This is not true of many of our continental cousins in the Euro Zone who, it seems, have taken up their options with increasing zeal since the first ‘commemorative’ €2 coin in 2004. Only 6 Euro Zone states issued commemorative €2 coins in 2004, whereas last year (2015) there were no less than 24 commemorative €2 coins issued by 15 different countries, i.e. 9 of these countries issued their maximum allowance of two commemorative €2 coins each. Conversely, it also means that they must be the same dimensions (diameter, thickness and weight) as normal €2 coins so that they will be accepted by vending machines. in January 2012, to commemorate ten years of euro banknotes and coins. The four, non-EU member ‘micro-states’ (Andorra, Monaco, San Marino and Vatican City are excluded from issuing these coins, although they are allowed to issue up to two commemorative €2 coins under the normal rules of the Euro Zone. As a rule, euro countries may each issue only two €2 commemorative coins per year. Exceptionally, they are allowed to issue a third, provided that it is one issued jointly and that it commemorates events of Europe-wide importance. These coins use a common design on the national side, showing the name of the issuing country as well as the event commemorated in the respective language(s). 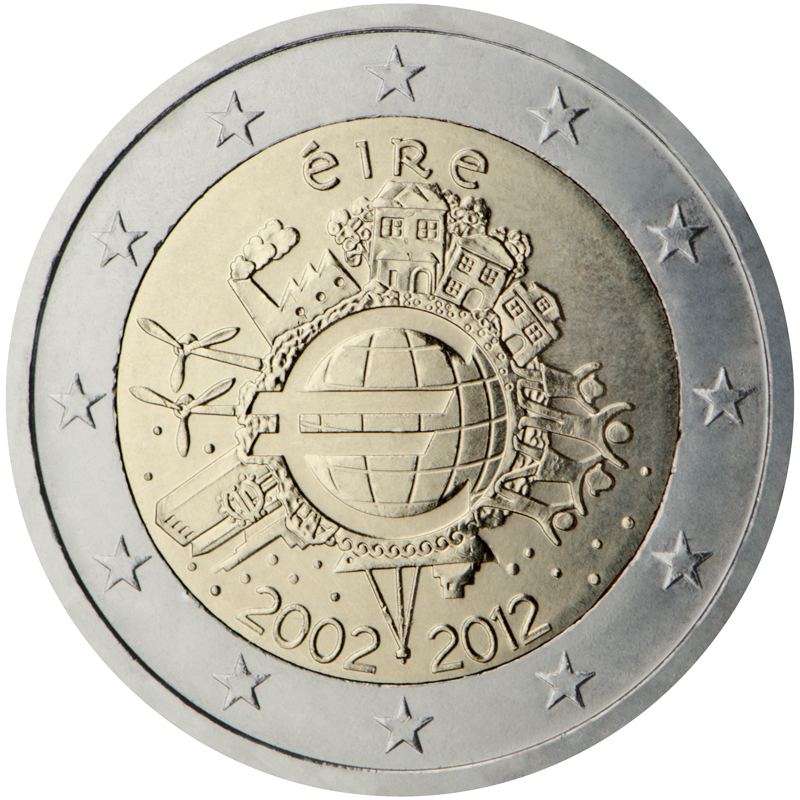 Ireland’s first commemorative €2 coin – issued jointly by all 13 Euro Zone member states in 2007. The coin shows the Treaty document signed by the six founding countries on a background evoking the paving (designed by Michelangelo) of the Piazza del Campidoglio in Rome, where the signing took place on 25 March 1957. ‘Treaty of Rome 50 years’, ‘EUROPE’ and the name of the issuing country appear in the respective languages of the euro area or in Latin. Thus, the legend differs from country to country, but the image is the same. The Treaty of Rome established the European Economic Community and ultimately led to the introduction of the euro in 1999 and the euro banknotes and coins in 2002. The anniversary was celebrated on 25 March 2007. The euro area countries have marked the occasion by jointly issuing this commemorative coin. Its design was selected following a competition organised by the European mints. The coin’s outer ring bears the 12 stars of the European Union. 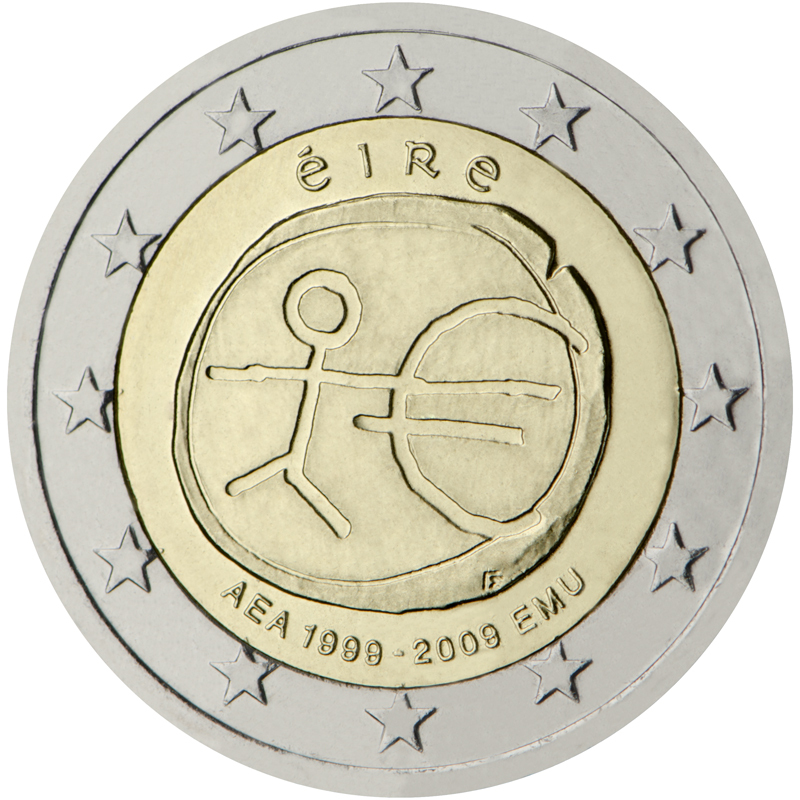 The coin shows a stick figure which merges into the € symbol. It seeks to convey the idea of the single currency and, by extension, Economic and Monetary Union (EMU) being the latest step in Europe’s long history of trade and economic integration. The coin is issued by each euro area country and shows the name of the country as well as the legend ‘EMU 1999-2009’ in the respective language(s). The design was chosen out of a shortlist of five by members of the public across the European Union voting online. It was created by George Stamatopoulos, a sculptor from the Minting department at the Bank of Greece. The coin’s outer ring bears the 12 stars of the European Union. The inner part of the coin, designed by Helmut Andexlinger of the Austrian Mint and chosen by citizens and residents of the euro area to be the common commemorative coin for 2012, features the world in the form of a euro symbol in the centre, showing how the euro has become a true global player over the last ten years. The surrounding elements symbolise the importance of the euro to ordinary people (represented by a family group), to the financial world (the Eurotower), to trade (a ship), to industry (a factory), and to the energy sector and research and development (two wind turbines). The designer’s initials, “A.H.”, can be found (if you look very carefully) between the ship and the Eurotower. The coin is issued by each euro area country and shows the name of the country in the respective language(s). Along the upper and lower edges of the inner part of the coin are, respectively, the country of issue and the years “2002 – 2012”. The coin will be issued by all euro area countries. The coin’s outer ring depicts the 12 stars of the European Union. The coin commemorates the 100th anniversary of the Proclamation of the Irish Republic which was read by Patrick Pearse outside the GPO on 24 April 1916. 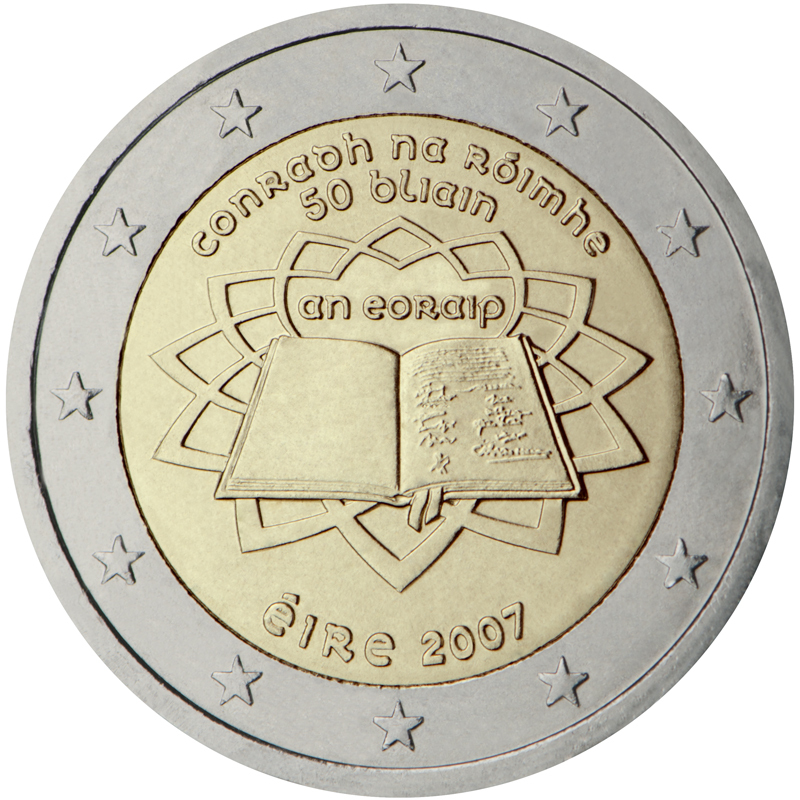 The coins depict the statue of Hibernia in front of an arrangement of key words and phrases from the Proclamation.